Today Monemvasia is sleepy, small and nevertheless unusual town. In medieval times this fortified town was a lot more important – it was one of the last strongholds of Byzantian Empire. 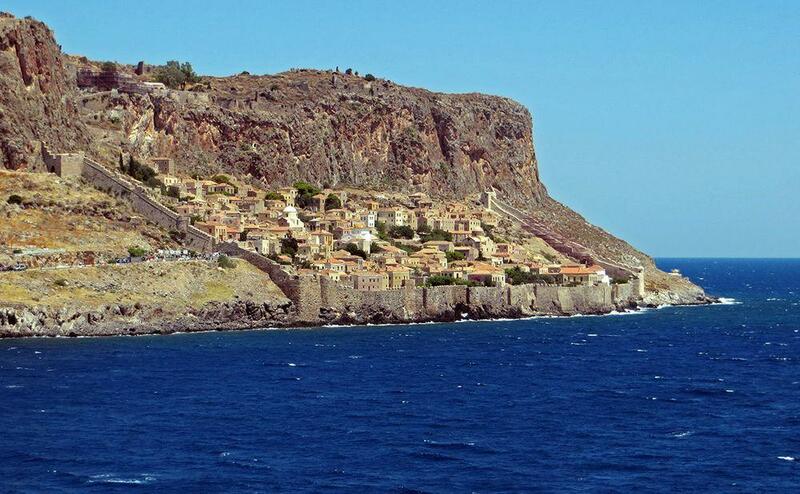 Nowadays Monemvasia is located on a small island but before, until the earthquake in 375 AD, it was peninsula. The island rises 194 m tall above the sea. The town is located on a steep coast of the island, between the rock and sea. Town is protected behind the city walls which were constructed in the Byzantine times. Walls – also towards the sea – are well preserved. Town is not visible from the mainland to make it harder to find it. It was accessible only from the sea and only later there was built a road until the walls of town. 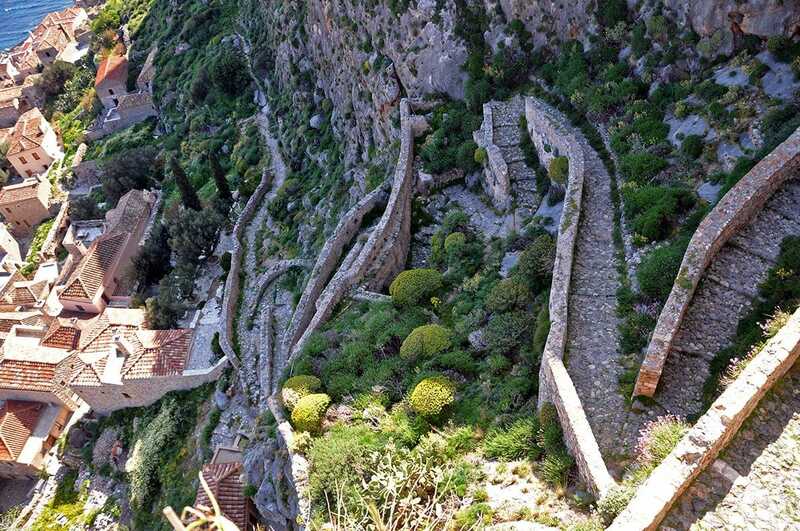 Monemvasia consists of two parts – the lower and upper. Lower part is the residential downtown with numerous small houses and Byzantine churches. Inside the walls streets are narrow and not suitable for cars what adds special charm. 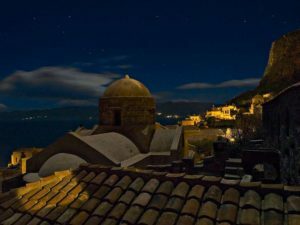 Above the downtown is located fortress (Palea Monemvasia or Kastro Monemvasias) with ruins of several residential buildings and church. This citadel is not inhabited anymore since the 1920ies. Both parts of the town are connected with impressive, winding pathway – a small wonder of medieval engineering. City walls included also small agricultural fields which could sustain some 30 men, thus making long sieges possible. Monemvasia was founded around 582 – 583 AD by a group of Greeks – Tsakonians – shortly before the Slavic and Avarian incursions. Tsakonians (Lakonians) are descendants of Spartans. These people accepted Christianity comparatively late and preserved Hellenic traditions longer than most of the other Greeks. Today Tsakonians are not here anymore: some hundreds of these people still live further to the north. Their language differs from Modern Greek – both are mutually unintelligable. Around the 10th century Monemvasia became an important port in Byzantine Empire. It was frequently attacked and due to this – fortified gradually making it practically impregnable. Later this small town was nicknamed the "Gibraltar of the East". The fortress nevertheless was taken (after 3 years long siege) in 1248 by Principality of Achaea – another local state, but in 1262 the fortress was returned to Byzantium. Until 1460 the town remained an important military base for Byzantium. The town gave its name also to Malmsey (Malvasian) wine – sweet wine which was transported through this port. Monemvasia was one of the last parts of the former Byzantium Empire which held out against the attacks of Ottomans for seven years after the fall of Constantinople – until 1460. The the elders decided to take the protection of Pope and, as it was not efficient and convincing, some years later Monemvasia choose Venetians as their governors. Gradually, step by step the power of Venetians also decreased. 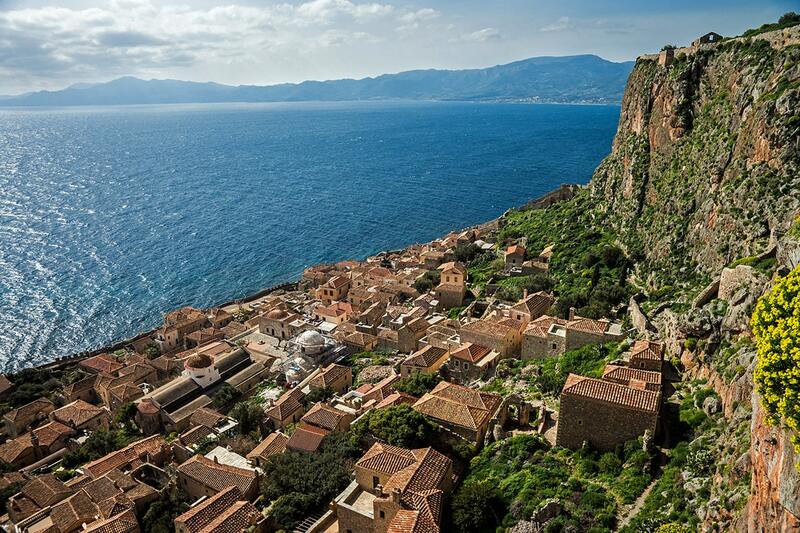 Monemvasia was one of the last Venetian properties in the area of present-day Greece until 1540. Only then Monemvasia fell to Ottomans and was part of their empire until 1821, although for some time it managed to be a part of Venetian Kingdom of the Morea. Since 1821 Monemvasia is in Greece. 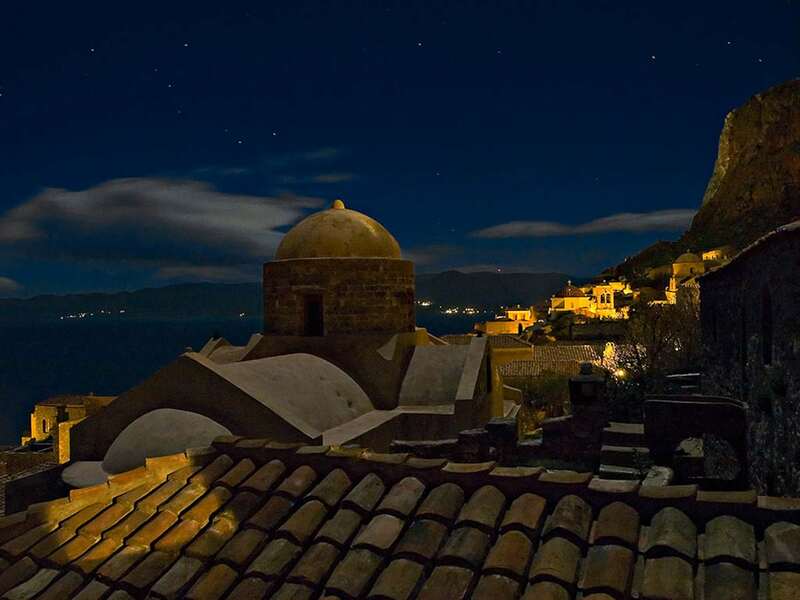 By that time the importance of Monemvasia decreased and the town declined – gradually people left this remote fortress. The changes came in 1971 when there was built a causeway to the mainland – by that time only 32 people were living in the town. Since then life came back to Monemvasia – not immediately but slowly, step by step. Now quite a few wealthy people from Athens spend their weekends here, Monemvasia is also fairly popular tourist destination. The Church of Elkomenos Christos Source – best known church in the town, dedicated to Christ who was led chained to the crucifix. Built in the 13th century in the site of earlier churches, and extended in 1697. Church contains valuable icons, also from the Byzantine times. Some icons are just legendary – stolen by pirates or taken away by Byzantine emperors, some regained and some – painted anew. Especially valuable is the icon of the Crucifixion which for long centuries – from the 14th to the 21st century was away from the church. Agia Sofia – one of the best preserved Byzantine churches in Greece, built in 1149 – 1150, has an octagonal planning. Located high above the downtown, in the eastern tip of the fortress. Its Byzantine frescoes were covered with lime during the Ottoman times but now are visible again. This might be the most picturesque landmark in Monemvasia, with wonderful sights. Agios Nikolaos – built in 1703 over the ruins of two Byzantine churches. Acording to local stories it never served as a church – this building was used as arsenal and then – as a local school. Panagia Chrysafitissa – legendary, domed church with a miracle-working icon from Hrisafa village. Panagia Myrtidiotissa (Panagia Kritikia) – this church built in the late 17th century. Some details in its architecture show Western influence. Greece is one of the few countries in the world where are located centres of ancient civilizations. And not just one – but several. 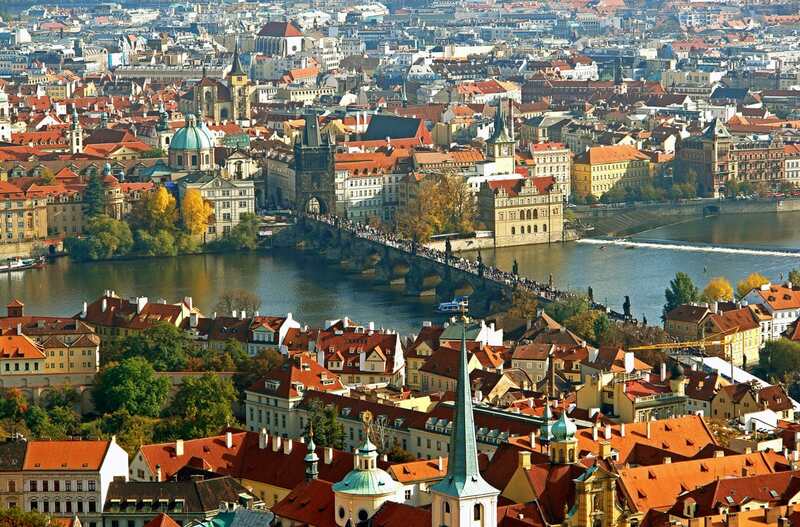 Archaeological and culture monuments here are older than in the remaining part of Europe and, in many cases – in the whole world. 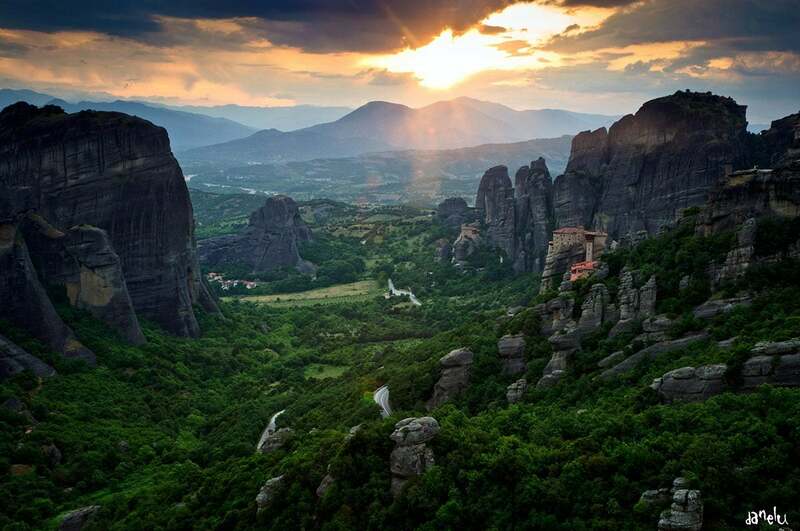 Wealth of important, unusual and even mysterious landmarks in Greece is overwhelming. This lavishly illustrated book stands out in its field as the only book currently available on the best-preserved Byzantine city in the Peloponnese – Monemvasia. 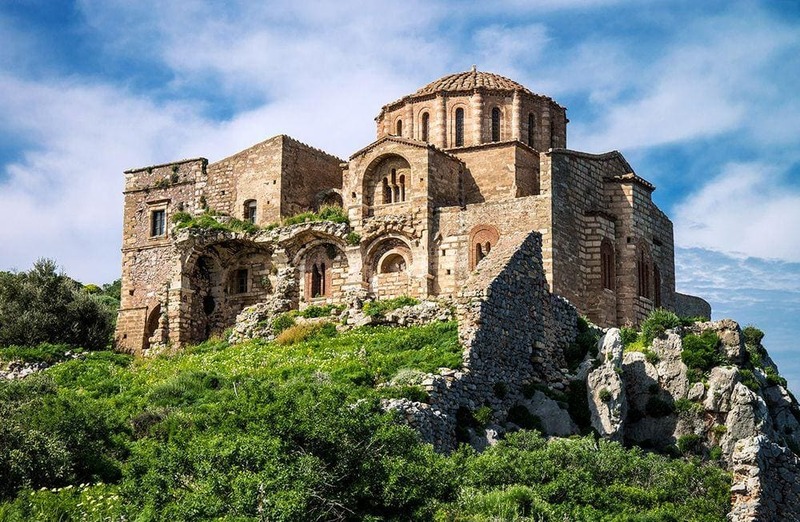 Haris A. Kalligas, a world authority on Monemvasia’s history and architecture, here explores the city’s foundation, its status as a powerful maritime centre of Byzantium, and its gradual decline after the fall of the Empire.